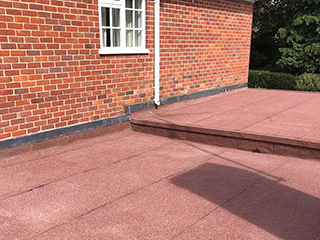 For almost forty years, A P Benson Roofing & Building have been installing and repairing flat roofs across the Surrey region. 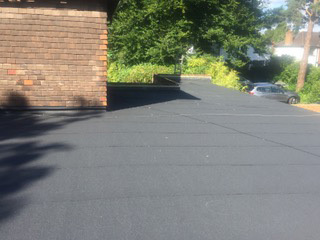 From our office in Guildford, our team of professional roofers have delivered flat roof services in Woking, Farnham, Godalming, Chobham and beyond, building a reputation for excellence among our thousands of satisfied customers. Why have a flat roof? While not as popular in the UK as pitched roofs, flat roofs do offer certain advantages worth considering and, indeed, are essential in certain circumstances. The primary advantage is that flat roofs are quick to install and take up less space than a pitched roof. Being little more than a horizontal base attached to the ceiling joists and covered by a waterproof membrane, they can be installed in a day, given the right conditions. Flat roofs are particularly suited to new additions to a house such as garages and extensions, where the structural integrity of the building is not affected by the roof design. Some people like to install green roofs – layers of grass and plants that form an attractive addition, as well as natural insulation to a property. Naturally, this is only possible with a flat roof as a base. Though slightly slanted to allow for run-off, flat roofs don’t drain as well as their pitched counterparts. Occasionally this can result in pooling water, where a puddle gathers in the membrane and is unable to drain away. Left unchecked, it can weaken the membrane below, causing significant damage and leaks. This occurs if pockets of air or moisture get trapped beneath the waterproof membrane of a flat roof. When warmed by the sun, these pockets expand. This causes the membrane to stretch, potentially weakening the roof. Working out of our Guildford office, we cover most of Surrey, including Woking, Chobham, Godalming and Farnham. We have been trading continuously since 1980, delivering flat roof repairs and installations across Surrey. Thanks to over a century of combined experience, our team of roofers bring a level of expertise to each job that is unmatched in the county. 01483 760 444 for a free quote.